I am dealing with a burning issue where Roxio Creator Silver 7 receives the "RITE_InvalidImageFile" error immediately after I click the arrow to burn the files to disc. It allow the user to click retry, which will continue the burning process until the very end. The same error is issued right before the files finish burning. Any suggestion on why this could be happening? It happens with multiple Blu-ray Drives. This issue occurs only with Blu-ray's and not regular DVDs. You posted in Creator NXT 3. Do you have that or do you have Creator Silver 7? What operating system are you using? 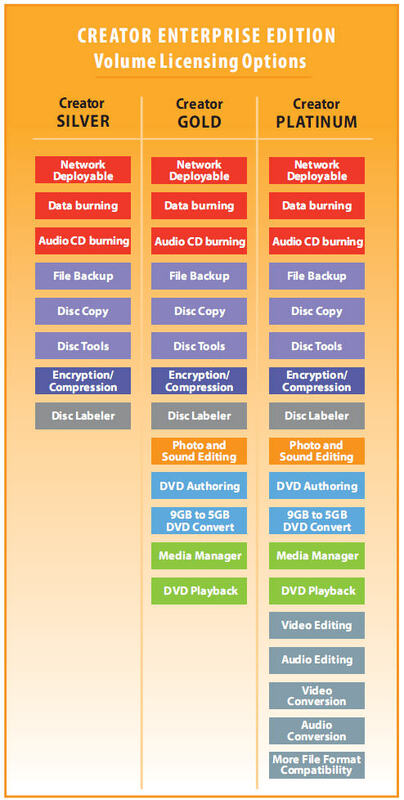 You may not have blu ray burning capability. This sales info doesn't mention blu ray burning capability. If it had that cability, it would be right near the top of the list. Contact your Roxio support representative. Creator 10.3 was the first to support BD Data Disc burning. Jim, they will work in Vista too. Edit: I didn't look at the date. Creator Silver is a restricted-capability Enterprise Edition which is Volume Licensed. As you can see, it has DVD Authoring restricted, unlike the Gold and Platinum versions. You will need to go back to your source and get them to take this up with the Volume Licensing Section at Roxio, or else buy yourself a version with full capabilities.